PULLMAN, Wash. – Consumer demand for safe, high quality, additive-free packaged foods is on the rise. Washington State University is advancing toward meeting this demand thanks to two recent investments in innovative food processing technology based on microwave energy. The U.S. Department of Agriculture’s National Institute of Food and Agriculture (NIFA) awarded WSU a $4 million grant to establish a Center of Excellence (https://nifa.usda.gov/centers-excellence) that will accelerate the technology transfer to mainstream commercial markets. This is the first Center of Excellence on Food Safety Processing Technologies funded by USDA NIFA’s flagship program, the Agriculture and Food Research Initiative (https://nifa.usda.gov/program/agriculture-and-food-research-initiative-afri). Meanwhile, a $7.2 million investment was announced in March by the Australian government to adopt microwave assisted thermal sterilization (MATS) technology. WSU and industry partner 915 Labs (http://www.915labs.com/) will provide the system to Australia’s Ministry of Defence. The two investments will provide improved ready-to-eat meals for convenience-oriented consumers and soldiers alike. 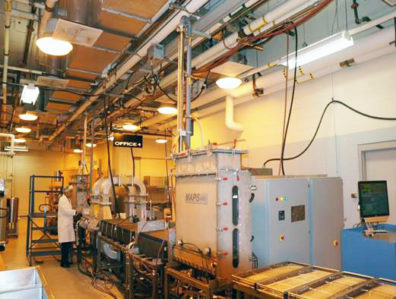 MATS and microwave assisted pasteurization systems (MAPS) use a combination of microwave heat and a hot water tunnel to rapidly heat packaged food to sterilization or pasteurization temperatures and hold it there for a minimum amount of time before quickly cooling it down. Two MATS food products filed by WSU and one by AmeriQual Foods have received U.S. Food and Drug Administration acceptance, paving the way for commercialization in the U.S.Regents professor Juming Tang and his team in the Department of Biological Systems Engineering developed the technologies and processing methods at WSU. Both technologies are licensed and sold through Denver-based 915 Labs. The company’s MATS/MAPS systems are in operation at several locations around the U.S., and major consumer food companies in Singapore and India have recently purchased systems. MAPS research at WSU. The new center will provide hands-on facilities for small and medium sized companies to develop their own products using MATS and MAPS. Over the next four years, the WSU Center of Excellence for Food Safety Using Microwave Energy led by Tang will focus on reducing technical and regulatory hurdles for small and medium sized companies to use the novel technologies in production of high quality, safe, ready-to-eat meals for a wide range of consumers. Tang expects the technologies will help food companies comply with the FDA Food Safety Modernization Act (FSMA) and will particularly benefit rural communities, where most small and medium companies are located. The WSU Center of Excellence research team includes Shyam Sablani, Carolyn Ross and Karina Gallardo. The $7.2 million Australian investment demonstrates the global interest in the technology. Like the U.S. military, which has long provided critical support for Tang’s research, Australia’s military is interested in healthier, better-tasting food options for its troops – as well as other consumers. “Defence investment in next-generation technologies, such as MATS, will have spill-over effects into other areas of the economy and help create local jobs,” said Marise Payne, Australia’s minister of defence, in a recent press release (http://www.minister.defence.gov.au/2016/03/09/minister-for-defence-7-2m-for-new-food-processing-technology-in-tasmania/). Australia will establish a research and development plant at the Defence Food and Nutrition Centre in Tasmania as well as a production facility with the systems purchased by 915 Labs. Australia is also interested in the commercial potential of MATS.